Maybe this is what I had on my mind when I went to work on another card for the Moxie Fab World Paper Scraps Challenge! As you can see, I used the inlay technique again (the die cut piece is flush with the frame). The vellum strip is just slightly bowed off of the card. I didn't want to cover up the colors too much, so the letters are only attached to the vellum at the bottom of each letter. I'm so happy with the cheery feel of this card! Now, I'm off to catch up on all the goodies in my Google reader. You all have been busy!! Thanks for stopping by and have a wonderful Easter weekend! Seriously fabulous! I love how the die cut circle is pefectly flush too! I'm crowning you the Queen of inlaid cards JJ! I'm just picking my socks off the floor because you knocked them off again! Super cool and colorful, JJ. Love the inset circle! And of course I love your brilliant card! The 'happy' looks like it's floating this way, which is fantastic, and the inlay? Simply awesome. So precise! 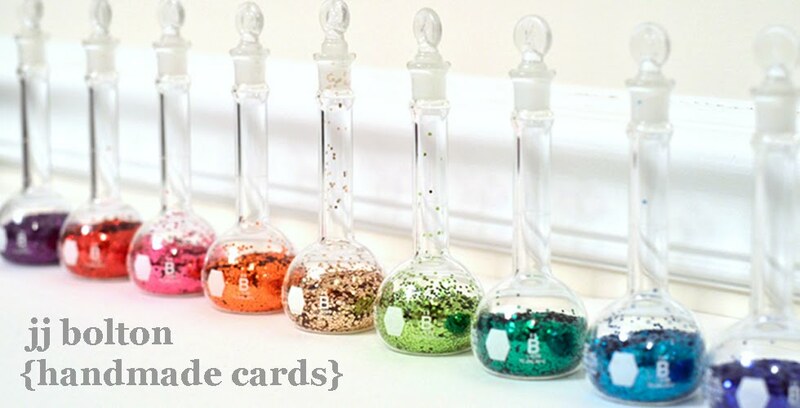 And rainbow colours? Man oh man. I can totally see how the photo would inspire you as well. Hope we get to hear more about your trip! I think rainbows are awesome, a color wheel is awesome, and quite frankly my dear...so are you! I plan on graciously losing to you on this one and I accept it gladly! fabulous. love the die cut and vellum under and over the circle die. Oh this is beautiful, I love your color inlay. Gorgeous card and the boys look natural…. :) lol. Looks like your the queen of this technique ! Hmmm, and I thought they were in a gymnasium playing racket ball for some reason. Somethimes with modern art there isn't much of a difference...imo hehee:)!! Your creation would never confuse me! Love the idea, it turned out perfectly. Awesome for sure! wow! this is absolutely fabulous! so very clever. amazing card! love love love! 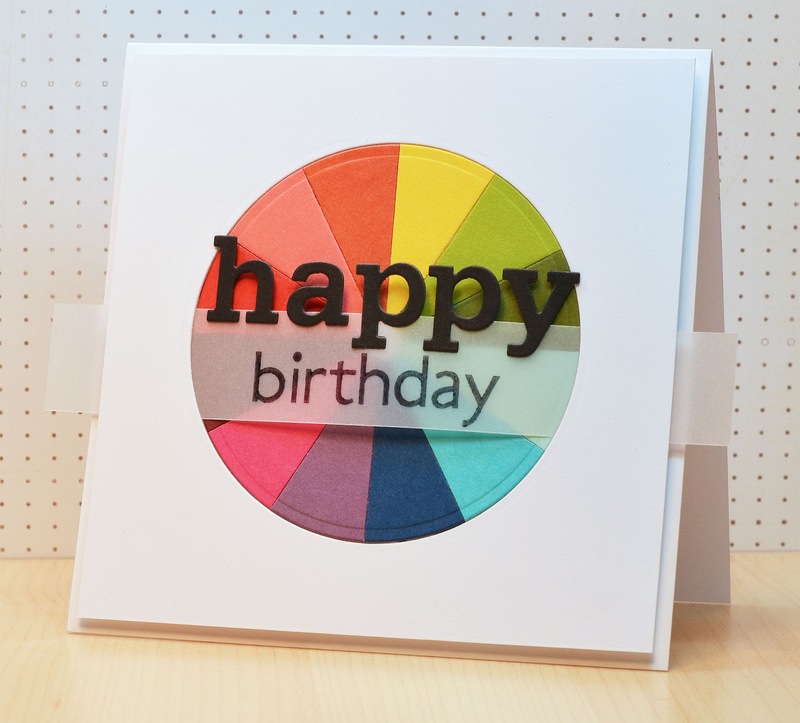 A fantastic cheery card JJ, love this wonderful color wheel! Brilliant! This is AMAZING - again - so impressed with your PERFECT diecutting and design - WOW!! Wow, you are so talented! 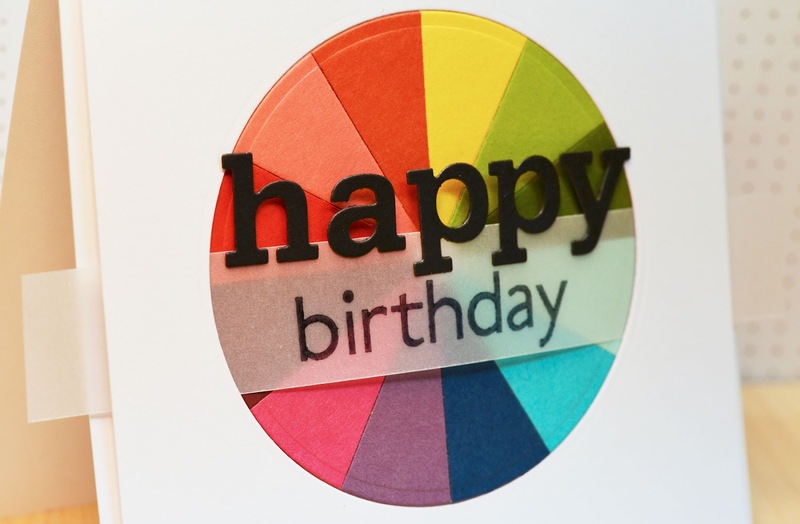 I love this color wheel! Amazing!! Fabulous!!! Gorgeous use of all the colors and sentiment is perfect!!! Your paper piecing technique is fabulous but what I love most is your creative sentiment. The vellum. The stamping. And then topping it off with the die cut alphas. Again, you make me think those are an essential tool. Awesome!! totally perfect! such a cool technique! Wow! How did you get the pie pieces so even? This is just amazing!